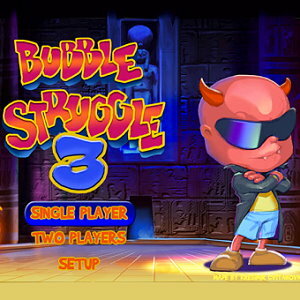 The long-awaited sequel to Bubble Struggle 2: Rebubbled is finally here! You’re still a devil with odd clothing, shooting down all sorts of bubbles before they can touch you. The bubbles often drop nice powerups like shields or extra firepower. And be careful when popping the bubbles, because they’ll split into smaller bubbles until you finally get rid of them. Note: See below game for instructions and tips. Instructions: Use your arrow keys to move around the screen. Press the spacebar to fire your weapon. You can sometimes shoot other things besides the bubbles to get extra points. Be sure to watch your timer; time can run out really fast! If you’re looking for more fun, check out the Slingshot Thong Bikini game, or Bra Inspector: Guess the Cup Size.